← Did you forget the time change? Saturday I shared my Halloween treat containers I made for the neighborhood kids. The brown fringe paper bag was from the September’s Paper Pumpkin kit. Aren’t they just too cute?! They went together in less than 30 minutes. It was fun making them! Ah, but there’s sad story why I’m posting this picture late. We’re on the last street in an older neighborhood farthest from the elementary school, so we usually have about 10 trick or treaters each year. Last year we only had 7. Yes, very sad and disappointing (and lots of candy leftover for my sweet hubby to eat!). So this year I planned for the usual 10 from my Paper Pumpkin kit and a few “Mummy Tummy” parent treats. We bought 6 large bags of candy (special deal, buy 1 get one – they were our favorites, M&M’s and Snickers bars) 2 weeks early. Not a good idea – my husband loves candy and each night he’d take a few as his dessert. But I thought we’d still be okay with our usual 7-10 kids showing up at our door. However, this year neighborhood parents sent an email with a map of all those who were giving out treats. Of course, I signed us up – big OOPS in planning for me! In the first 30 minutes I had over 30 little ones show up to our door. The fringed bags and Mummy Tummys were gone in a flash, and I had to give out just the candy (that my husband thought was his private stash!). When the next 10-12 showed, all under 4 with 8 parents, I ran out of candy – OH NO!! I apologized profusely, but several little ones went away in tears even though daddies were explaining it’s okay, we’ll try again next year. My sweetie, bless his heart, did offer to run to the store to buy more, but we decided we’d just plan better for next year. We turned our lights off, close the blinds all by 7 pm! I had nightmares all night long having disappointed those cute little ones all decked out in their costumes! So next year, we will have an overload of candy (bought just before the holiday, not 2 weeks early, and hidden from my sweetie so we’ll be sure to have some left!)! Lesson learned, when you post on your neighborhood’s Social Media site, expect lots of little kids!! 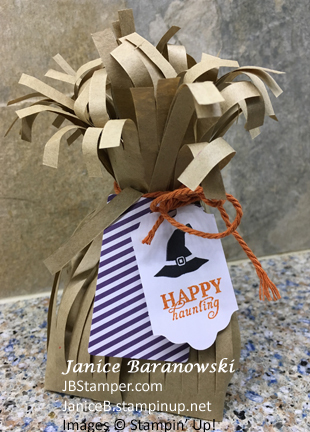 This entry was posted in 3-D Projects, Gift bags, Halloween, Paper Pumpkin and tagged Happy Haunting, Stampin' Up!, treat bags. Bookmark the permalink.